Glen Arbor artist Harvey Gordon exhibits a range of work in the Glen Arbor Arts Center’s Hall Gallery. Each of Gordon’s paintings begins with a photographic image, and then grows as the artist lays down layers of paint. 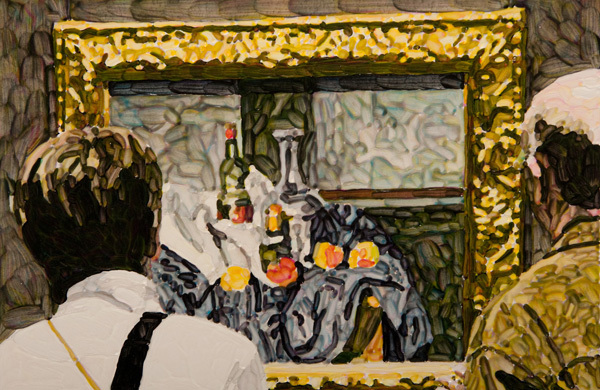 His technique integrates major characteristics of Post-Impressionism, and moves forward from that era through his use of materials and technology. Gordon’s paintings have been exhibited widely, received several awards, and been the subject of eight one person exhibitions in New York City galleries and six in Michigan museums, including Flint, Grand Rapids, and Kalamazoo. His work has been collected by museums, corporations, and private collectors in this country and abroad. His writing on art and culture has been published in several periodicals, and he taught art at the college level for thirty years. Gordon’s work can be seen until December 23 at the GAAC, 6031 S. Lake St., Glen Arbor. Harvey Gordon was born in Flint in 1941 and attended Flint Public Schools, the University of Michigan, Mott Community College, Cranbrook Academy of Art (BFA), and the University of North Carolina (MFA). He has lived in Michigan and vacationed in northern Michigan almost all his life and has lived in Glen Arbor since 2004.